Neodymium is a critical element used in many high-tech applications. However, despite this, the EU is entirely dependent on China for its Nd supply. This has driven the EU to develop recycling strategies to recover its Nd from end-of-life (EoL) products and wastes, and establish a domestic supply. This paper proposes a process to recycle Nd from NdFeB magnet particles present in the ferrous fraction of shredded “Waste Electrical and Electronic Equipment” (WEEE), after physical upgrading. This WEEE fraction represents a waste stream that has not been previously considered a source of Nd. A three-step process was developed. First, the upgraded ferrous WEEE fraction is oxidized by means of water corrosion. Second, the oxidized WEEE is leached with diluted H2SO4 to selectively extract Nd and other nonferrous elements. And finally, the leach liquor is treated with Na2SO4 to precipitate the Nd as its double sulfate (Nd, Na)(SO4)2. The oxidation process oxidizes 93% of the metallic iron to Fe(OH)3, leaving 7% of the iron unoxidized. The leaching process dissolves between 70 and 99% of the Nd, depending on the temperature and liquid/solid ratio (L/S); this is accompanied by an iron coextraction between 9 and 20%. The precipitation recovers 92% of the leached Nd. The purity of the obtained precipitates is dependent on the pH at which the precipitation takes place. A pH below 0.5 is required to prevent Fe contamination, and a pH below 0 reduces the Ca contamination to below 1 wt%. The developed process provides an effective and low-cost method to recycle Nd from a shredded WEEE stream with an overall Nd recovery of over 90%. The rare earth elements or REEs are a collection of 17 chemical elements [15 lanthanides plus yttrium (Y) and scandium (Sc)], which are becoming increasingly important in modern-day technology. With applications in electrical and electronic devices (e.g., capacitors, phosphors, and high-strength magnets), chemical industry (e.g., catalysts), and green energy (e.g., batteries and windmills) [1, 2, 3, 4, 5], they are an essential resource for many industries. However, to meet this increasing demand, the EU is entirely dependent on REE imports from China , as there are currently no active REE mines, nor production, in the EU . This dependency, combined with the recent instability of the REE market , has driven the EU to consider recycling end-of-life (EoL) REE-containing products in order to reduce this dependency and to ensure the availability of the most critical REEs in the future. Neodymium (Nd) is one of the most critical REEs that the EU wishes to recycle. This element is a key component of Neodymium–Iron–Boron (NdFeB) high-strength magnets. These magnets are approximately 2000 times stronger than traditional ferrite magnets and are used in a variety of applications, ranging from miniature magnets in high-tech devices (such as hard disk drives (HDDs) and speakers) to large 2-ton windmill magnets. A stable supply of Nd is crucial to ensure the future production and development of such applications within the EU. The recycling of Nd is currently limited to the recycling of production scrap and separately collected large EoL magnets (such as those from windmills). The methods for recycling Nd from these waste streams are well established . Most involve dissolving the magnet scrap in acid and extracting the Nd via either precipitation or solvent extraction. However, these methods have only been proven to work on discrete magnets. This has limited the overall recycling of NdFeB magnets, as collecting and separating the magnets from their devices is a very labor intensive and expensive endeavor. Although some automated disassembly methods have been developed recently (e.g., the Hitachi process for HDDs ), the presence of small NdFeB magnets in electronic and high-tech devices is still largely being ignored, and they end up mixed in with a general “Waste Electrical and Electronic Equipment” (WEEE) stream, from which Nd is not recycled. Many elements are recycled from WEEE. Iron, copper, and aluminum, as well as gold, silver, and palladium, are currently being selectively extracted from this complex waste stream . This is done by first shredding the WEEE and further processing in a physical separation plant. This plant then separates the WEEE into various streams based on their main component (magnetic separation yields a ferrous and a nonferrous stream, eddy current methods separate copper from aluminum, etc.). Each stream is then sent to either a hydrometallurgical or pyrometallurgical plant for further processing and refining. However, little research has been done to also extract Nd from shredded WEEE streams. The amount of Nd in WEEE is steadily increasing, as is the importance of Nd to the EU, and therefore efforts are now being made to also recycle Nd from this waste stream. The goal of this study is to develop a hydrometallurgical process to extract Nd from shredded WEEE and then implement this process into a WEEE recycling flowsheet developed in a recent EU-funded project REEcover , as shown in Fig. 1. To do so, first the most appropriate stream coming from the WEEE physical separation plant must be selected. The Nd magnets will naturally follow the steel within WEEE and thus will end up in the ferrous stream after magnetic separation. Therefore the ferrous stream is the focus of this work. Once the shredded ferrous WEEE stream has been collected and properly upgraded (to maximize the Nd content) a hydrometallurgical process can be developed to recover the Nd. When this is achieved, the recovered Nd compounds can either be used directly or converted to its pure metallic form through conversion and molten salt electrolysis. 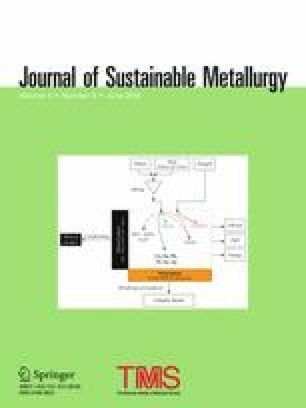 The raw material used in this research originates from INDUMETAL RECYCLING, Spain. A survey of all the end streams of their WEEE shredder shows that 83% of recovered Nd is present in the ferrous end stream, while the remaining 17% is distributed over various fine and dust fractions. (This survey does not account for any Nd that adheres to the shredder equipment due to high magnetic strength of the magnet particles.) Therefore, the ferrous end stream was selected as the input material for recycling in this work. The ferrous stream has an initial Nd concentration of 490 ppm and was first physically upgraded at the Luleå University of technology (LTU) . The physical upgrading involved thermal demagnetization, grinding, and sieving. The resulting material is a fine powder, with a particle size smaller than 75 µm, which is a mix of metals and oxides and no longer contains magnetized particles. Characterization of the upgraded material was conducted using inductively coupled plasma optical emission spectrometry (ICP-OES) (SPECTRO ARCOS ICP-OES ) to determine the chemical composition and using X-ray diffraction (XRD) (Bruker D8 Advance diffractometer ) to identify the most abundant phases. For the chemical analysis of the material, a borax fusion was required to fully dissolve the material for ICP-OES measurement. The fusion was prepared by mixing 1 g Na2B4O7 and 1 g Na2CO3 with 0.2 g of sample in a platinum crucible. The mixture was then heated to 1000 °C in a box furnace and held for 1 h. Finally, the resulting glass was dissolved in 150 ml 21.6 wt% HNO3 in aqueous solution to obtain the solution for analysis. In order to have a measure of the variation introduced by heterogeneity of the input material and machine accuracy, four samples were taken from the well-mixed input material and analyzed. The four results were averaged, and the standard deviation (σ) was calculated. The results of the analysis are shown in Table 1. The analysis shows that the material is fairly homogeneous for WEEE, and the accuracy of the ICP-OES machine is reasonably high, with a relative standard deviation for most elements being less than 5% (exceptions are Sm and Pb which have relative standard deviations above 50%). The major elements are Fe, Zn, and Mn, which suggests that (galvanized) steel is the main component which is expected for a ferrous WEEE fraction, and the main impurities are Cu, Ni, Ca, and Si. The main REE component is Nd with a concentration of 0.99 wt%, which shows that the upgrading process by LTU increased the Nd concentration with a factor of 20 and was thus successful in producing a material with an acceptable REE concentration. Pr and Dy are also present, as they are common alloying elements for NdFeB magnets. Trace amounts of Sm are detected as well (originating from SmCo magnets), but the concentration is very low. 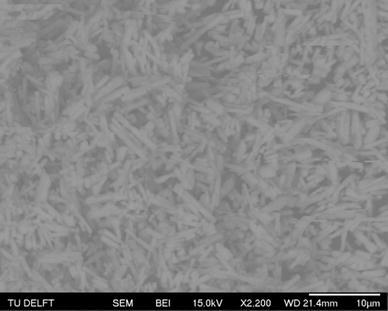 The XRD analysis was performed on 100 mg samples deposited on a Si510 wafer, using Bragg–Brentano geometry and a Lynxeye position sensitive detector. Cu Kα radiation (λ = 0.15418 nm) was generated at 45 kV and 40 mA, and a scatter screen was placed at a height of 5 mm. The measurement scanned 2θ from 10° to 130°, with a step size 0.034° and a counting time per step of 2 s. The data were analyzed using Bruker software DiffracSuite.EVA vs 4.2. The results of the XRD analysis are shown in Fig. 2. The XRD analysis shows that the most abundant phases are Fe3O4, Fe, CuO, and SiO2. Note that the Fe3O4 peaks in the spectrum are a combination of both Fe3O4 and Fe3O4 alloyed with Zn and Mn (concluded based on the chemical analysis in Table 1), indicating the possible presence of galvanized steel in the WEEE. From this analysis, we can conclude that a large fraction of the Fe in the WEEE has already been oxidized during the demagnetization pretreatment. The goal of this research is to extract Nd from the upgraded ferrous WEEE stream and do so, as selectively as possible. The selectivity is important as it will reduce the number of process steps required to obtain a pure rare earth oxide (REO) phase, which will reduce the overall recycling costs. It also allows for the residual WEEE to be further recycled for its Fe content. Initial exploratory leaching has shown that direct acid digestion is not selective and that even with diluted or weak acids, the Fe dissolution is significant, with dissolution ranging from 50 to 80%. This is likely caused by the fine particle size of the material (less than 75 µm), which enhances the reactivity of all its components. Because of the high Fe coextraction, a pretreatment is proposed in order to reduce the Fe coextraction. The pretreatment aims to oxidize the Fe present within the WEEE to its Fe3+ state, which is unstable in solution when the pH is higher than 1, for a Fe concentration higher than 1 M, and begins to precipitate as Fe(OH)3 (see the E–pH diagram of Fe in Fig. 3). This, in combination with appropriate leaching conditions, should decrease the degree of Fe coextraction. This is the same principle used in magnet recycling, when the magnets are roasted to convert the metallic Fe into its more inert oxides . However, roasting is an energy-intensive and costly operation, and additionally, the upgraded ferrous WEEE does not lend itself well to roasting due to its small particle size, which could cause sintering or even ignition of fine Nd particles, as they are pyrophoric. As an alternative to roasting, we propose a water-based corrosion process to oxidize Fe, which is expected to be reasonably fast and cheap, due to the small particle size of the material. If the entire Fe can be successfully oxidized, diluted acid leaching can be used to extract Nd from the oxidized WEEE while leaving the majority of the Fe behind as solid residue. in a sulfate environment. The Na can be provided by either NaOH or Na2SO4. This precipitation reaction offers an alternative to the traditional oxalate precipitation, which is more expensive . The oxidation pretreatment was performed in a 1-l glass reactor equipped with oil bath, condenser, and O2 injection. 100 g batches of upgraded WEEE were stirred in 500 ml demineralized water under three different conditions (6 h at 80 °C, 24 h at 80 °C, and 24 h at 45 °C), while 40 L/h of O2 was bubbled through the reactor. After the oxidation, the WEEE was filtered with a vacuum filter on a 4-µm filtration paper. The oxidized material was then dried overnight at 105 °C to remove moisture. The dried samples were analyzed with XRD to determine the level of oxidation by comparing their spectra to the base spectrum (Fig. 2). The samples of the conditions that yielded the highest oxidation level were selected for leaching experiments. Leaching experiments were performed in a 100-ml glass reactor for room-temperature (21–23 °C) experiments and in a 250-ml reactor for experiments at elevated temperatures (see Fig. 4). The diameters of both reactors are identical. The reactors are equipped with overhead stirring, and the 250-ml reactor is also equipped with a condenser and oil bath. Leaching experiments were performed on 20 g batches of the oxidized WEEE. It should be noted that the oxidation process does have a minor diluting effect on the Nd concentration of the ferrous WEEE, due to the increase in mass caused by the conversion of Fe to Fe(OH)3/Fe2O3. The leaching conditions were chosen such that only the required amount of acid (stoichiometrically) is supplied to the system to dissolve the reactive nonferrous elements. Due to the minimal amount of acid that is required, this will allow for the pH of the solution to increase over time, removing most of the Fe that would have been coextracted from the leach liquor. Based on the chemical composition of the upgraded WEEE, 0.043 mol of H2SO4 would be required to dissolve all nonferrous elements, which (including a 25% excess) translates to 3 ml of 98.08 wt% H2SO4. The investigated leaching parameters were temperature and liquid/solid ratio (L/S). The investigated temperatures were 21 °C (room temperature), 45, and 70 °C at a constant L/S of 5 and the investigated L/S at room temperature were 2 and 5. For the investigation of the L/S dependence, two different approaches were explored: leaching with a constant acid volume and leaching with a constant acid concentration. This is performed to account for the stoichiometry of the reactions, as leaching at a lower L/S while maintaining the same acid concentration as at L/S = 5 will result in an acid deficit for all nonferrous elements, yet should still supply enough acid for the Nd dissolution. Before the leaching experiments presented in this work were run, the leaching setup was first thoroughly tested to ensure consistent results. During this testing, it became clear that the largest source of variance was the ICP-OES measurement. As such, all samples taken from the leaching experiments were measured in triplicate to ensure reliability. To demonstrate the consistency of the leaching setup, the room-temperature L/S = 5 experiments were run in triplicate. The results obtained, see Fig. 6 and Table 3, show that the data are consistent (save for the minor elements Sm and Dy). The uncertainty that is observed is of the same magnitude as that of the ICP-OES analysis. This shows that running experiments in triplicate are not crucial with this leaching setup, and analyzing each sample in triplicate is more important. During leaching, the liquor was sampled at times 1, 5, 10, 15, 30, 45, 60, 90, 120, 240, and 360 min. The samples taken were immediately syringe filtered (0.45 µm) to quickly remove the solids from the sample and prevent further reaction. They were diluted with 3 wt% HNO3 to ensure that no precipitation takes place in the sample before the analysis. The precipitation experiments were performed in a glass beaker on a hot plate equipped with magnetic stirring. The leach liquors were re-acidified prior to precipitation to control the pH during the reaction and to prevent undesired side reactions. The precipitation agents used were Na2SO4 and NaOH. Both these precipitation agents were also compared to the classical H2C2O4 to observe their effectiveness. Precipitation was performed at 70 °C, as the solubility of (Na, Nd)(SO4)2 decreases with the increasing temperature . Precipitation experiments were run for 24 h with a large excess of precipitation agent (25 times the stoichiometry). The initial pH of the solution was set at 0, 0.5, and 1 to determine its influence on the purity of the precipitates. The precipitates were recovered on a 4-µm filtration paper and dried at 105 °C. Afterward, they were analyzed with XRD and SEM/EDS, followed by re-dissolution in HNO3 for ICP-OES analysis to measure their purity. The results of the XRD analysis of samples taken from the three oxidation conditions are shown in Fig. 5. By comparing the spectra and evaluating the differences in the intensities of the metallic Fe peaks, an estimate for the degree of oxidation can be calculated, see Table 2. Under the conditions (24 h at 45 °C), (6 h at 80 °C), and (24 h at 80 °C), this yields oxidation levels of 83, 59, and 93% respectively. The table shows that the condition of 24 h and 80 °C is optimal for the tested cases, suggesting that even for a fine powder, the oxidation takes some time to complete. It should be noted that none of the three conditions leads to a total Fe oxidation, which indicates that some of the Fe is likely stainless steel, a common component of WEEE. This would also explain the presence of Ni (Table 1), which does not show up as a separate component in the XRD spectra. The oxidation process shows that time is more important than temperature for the level of oxidation and that the temperature determines which oxidation product is formed. At 45 °C, the main oxidation product formed is FeO(OH), while at 80 °C it is Fe2O3. As the highest oxidation level was achieved at 24 h and 80 °C, this oxidation condition was chosen as the best one to produce the samples for the leaching experiments. The extraction profiles of Nd and Fe at room temperature with L/S = 5 are presented in Fig. 6. The extraction profiles show relatively rapid overall reaction, which stabilizes after about 90 min. Nd extraction is significant with a final extraction of 90% under the current conditions. During the initial 30 min, the reaction appears to be quite unstable, due to the great sensitivity to the sampling time. The coextraction of Fe was not fully prevented, but was limited to 21% (as opposed to the 50–80% without oxidation). where Rx (x = Nd/Fe) is the extraction of Nd or Fe in % and t is the time in min. The coefficients α and β give a measure for the final extraction (α) of the element and its rate of extraction (β). Applying this interpolation, using OriginPro 9, to the data points yields α = 89.6 and 20.7%, and β = 0.91 and 0.08 min−1 for Nd and Fe, respectively. Based on these expressions and the extraction profiles, it is clear that Nd reacts faster than Fe. Defining that the total process has stabilized when the Fe extraction reaches 95% of its final value, we obtain the necessary reaction time as 37 min. Theoretically, the reaction does not have stabilize, and a greater selectivity of Nd can be achieved if the reaction time is limited such that Nd extraction reaches 95% of its final value. Based on the interpolations, Nd extraction reaches 95% of its final value in 3.3 min, at which time the Fe extraction is calculated to be only 4.8% instead of its stabilized extraction of 21%. The final extractions of the leached elements after a reaction time of 360 min are listed in Table 3. All REEs associated with NdFeB magnets (Nd, Pr, and Dy) show high extraction, while the Sm extraction is only 21%. The other elements with considerable extraction (other than Fe) are Cu and Zn; however, these two elements can potentially be removed with a prior ammonia leaching. Ammonia leaching is a mature technology that can recover up to 90% of the Cu and 70% of Zn in traditional WEEE recycling process . It could potentially be added to the process here with little extra chemical cost, as the ammonia can be recovered during the electrotwinning of Cu. However, the inclusion of ammonia preleaching would require the use of an extensive washing step, to be performed between the ammonia leaching and the H2SO4 leaching of Nd. No ammonia should be present during the H2SO4 leaching, as ammonia (like Na2SO4) can serve as a precipitation agent for (NH4, Nd)(SO4)2 double sulfates, which can negatively impact the extraction of Nd during leaching. While this challenge can be overcome, it is not the focus of this work and could be studied in the future. 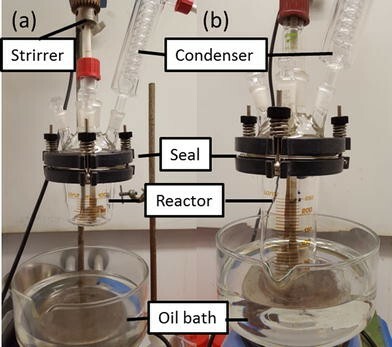 Despite the extraction of other elements, it is clear that this leaching process with oxidative pretreatment has a relatively high selectivity for Nd (and other REEs present in the magnet particles). The concentration of Nd in the leach liquor achieved after leaching under these conditions is 1.77 g/L. The influence of temperature is observed by comparing the extraction profiles of Fe and Nd at 45 and 70 °C to those at room temperature. The results are shown in Fig. 7. For clarity, the error bars of the room-temperature profile are not shown; however, these profiles are identical to that shown in Fig. 6, and the level of error shown there is representative. The increase in leaching temperature has two clear effects: first, it increases the overall reaction rate. Applying the same exponential fitting that was used for the room-temperature experiments (Fig. 6) shows that the Fe dissolution reaction reaches 95% completion at 6.7 min at 45 °C (α = 22.06 and β = 0.45) and 2.2 min (α = 21.25 and β = 1.39) at 70 °C, which is a considerable decrease from the 37 min required at room temperature. The Nd profiles cannot be fitted with interpolation Eq. (2), which indicates that at elevated temperatures, this reaction finishes before the first sample (at 1 min) can be taken. This also means that increasing the selectivity reaction by stopping the reaction early becomes more challenging at higher temperatures as reaction times for Nd will be less than 1 min. The second effect is that the Nd extraction has been driven to near-total extraction with 95% at 45 °C and 99% at 70 °C. The maximum Fe extraction, on the other hand, has not increased; although the Fe extraction reaches 20% more quickly at higher temperature, it does not exceed it—in fact, after 360 min, it even decreases to 19% at 70 °C. This decrease in Fe concentration over time suggests the possibility of precipitation of Fe3+. However, this cannot be verified as it is impossible to differentiate between precipitated Fe(OH)3 and the undissolved Fe2O3/Fe(OH)3 formed during the oxidation pretreatment. The minor decrease in Fe extraction of time and the minor overall increase of Nd extraction show that the temperature only has a minor influence on the leaching system. The most prominent effect of temperature is the rate at which equilibrium is achieved. The extractions of all extracted elements are displayed in Table 3. With the increasing temperature, higher extractions of the Cu, Pr, and Dy are also observed, while Zn, Sm, and Ca appear relatively unaffected. The influence of the liquid/sold ratio is observed by comparing the extraction profiles of both the constant acid volume approach, Fig. 8a, and the constant acid concentration approach, Fig. 8b, at L/S = 2 to the extraction profiles at L/S = 5 at room temperature. When leaching with a constant acid volume approach (Fig. 8a), a decrease in L/S from 5 to 2 manifests as an increase in leaching rate. The decreased L/S combined with the same acid volume translates to leaching at a higher acid concentration (0.53–1.325 M), leading to increased leaching kinetics. For the process, this means that stability is reached quickly, and fitting shows that the time required for Fe dissolution to reach 95% completion is 3.3 min (α = 23.48 and β = 0.92) as opposed to the 37 min at L/S = 5. This shows that kinetically the increased acid concentration has a similar effect as raising the temperature to 70 °C. However, other than increasing the leaching rate, the liquid/solid ratio does not affect the stabilized extraction (as they were at higher leaching temperatures), meaning that increasing the temperature leads to superior results, compared to decreasing the L/S (using the same acid volume). When the acid concentration is kept constant (Fig. 8b) for leaching at L/S = 2, the differences in leaching behaviors are more pronounced. Both the Nd and Fe extractions are considerably lower than those at L/S = 5: 72% versus 90% for Nd and 9% versus 21% for Fe. This indicates that the other nonferrous elements, in combination with the reaction of Fe, consume too much of the available acid to ensure a high Nd extraction. A summary of the major extracted elements for both approaches is shown in Table 5. From these results, it can be inferred that Zn and Fe dissolution decreases more rapidly with a lower acid volume than that of Nd. Cu no longer dissolves at all, showing that for this system, Nd is more reactive than these elements and that a lower acid volume leads to higher leaching selectivity for Nd. The Ca extraction has not been negatively affected, implying that Ca is the most reactive element in this system. The results also clearly show that the acid volume is the determining factor for the level of Fe extraction; acid concentration does not contribute to the Fe extraction. Considering this, the initially proposed acid volume (enough to ensure stoichiometry for the nonferrous elements) is necessary to ensure an efficient Nd recovery. Lower acid volumes, while beneficial in terms of selectivity, do not yield sufficient Nd extraction (Table 4). Of note is that the reduced L/S does lead to higher concentrations of Nd in the leach liquors: 4.6 and 3.5 g/L, respectively. However, as the results of the next section will show, this increase is not necessary to ensure high Nd recovery rates. The achieved concentration of 1.7 g/L at L/S = 5 is sufficient for recovery. Table 5 shows the effect of NaOH, Na2SO4, and H2C2O4 on the purity of the obtained precipitates, when they are used as precipitation agents to recover Nd. The precipitation agent was added to a pregnant leach liquor at 70 °C for 24 h, with only minor re-acidification of the solution. From these results, it becomes clear that, under the present conditions, NaOH and H2C2O4 are not suitable as precipitation agents, as the precipitates are heavily contaminated with Fe. For NaOH, this is due to the increasing pH that occurs due to the addition of the NaOH, which leads to the formation of Fe(OH)3 and Fe(OH)2 as byproducts during the precipitation process. The use of NaOH also eliminates any possibility of recovering the acid from the leach liquor. H2C2O4 has an affinity for Fe and can form iron oxalates at 70 °C when the pH is not sufficiently suppressed, which leads to the Fe contamination observed in the recovered oxalates. Na2SO4, on the other hand, shows a far lower, but still considerable, Fe contamination and was thus selected as the precipitation agent for further experiments. The influence of the starting pH is shown in Table 6. It is clear that when the leach solution is heavily re-acidified with H2SO4, it is possible to fully remove the Fe contamination from the formed double sulfates. This is most likely due to the increased solubility of Fe3+ at these low levels of pH. The major contaminants still remaining in the precipitates are Zn (unaffected by pH) and Ca, which decreases with pH, but is not eliminated. The Nd recovery as double sulfate at pH 0 is 92%, implying that not all Nd is recovered using this method. The influence of the pH on the precipitation using oxalic acid was also investigated. The results are shown in Table 7. By performing the precipitation at a pH of approx. 0 (measured value 0.15), the coprecipitation of Fe and Ca is eliminated; however, the coprecipitation of Cu and Zn is not. Based on these results, it is concluded that Na2SO4 is the most optimal precipitation agent for this system. SEM analysis, illustrated in Fig. 9, of the obtained precipitates shows that they form needles with an average length of 5–7 µm and a thickness of approximately 1 µm. Due to such a fine size, complete capture of the precipitates is challenging. XRD analysis of the precipitates confirms that they are double sulfates. Based on the results obtained from the experiments, a flowsheet for the hydrometallurgical recovery of Nd can be constructed. The established flowsheet and its implementation into a general WEEE recycling process are illustrated in Fig. 10. The process design interlinks the oxidation and leaching steps by oxidizing the upgraded ferrous WEEE at the required liquid/solid ratio and then adding a small volume of concentrated acid to initiate the leaching step when oxidation has been completed. This conserves the heat of the oxidation and eliminates a filtration step. The preserved heat allows for rapid leaching (1–5 min), after which the pregnant leach solution is filtered and transferred to a precipitation tank. While oxidation experiments were run with pure O2, this should not be required for a larger-scale process. With proper mixing and reactor design, air is expected to work just as well as the oxidizing agent. It should also be noted that the oxidation of Fe is an exothermic process and that on an industrial scale the produced heat can be considerable. With proper isolation to conserve heat during reaction and filtration, it should be possible to run the entire process without any external heating and solely use the heat produced due to oxidation of the Fe during the oxidation process. Based on the obtained results, this process yields an 91% overall Nd extraction, and Nd is recovered as (Na, Nd)(SO4)2 crystals with minor impurities of Ca (8800 ppm) and Zn (2800 ppm). The (Na, Nd)(SO4)2 crystals are considered the end-product of the process proposed in this work. Currently, the traditional method of converting these double sulfates to oxides involves dissolution, and then re-precipitating them as oxalates and then calcining the oxalates. Alternatively the double sulfates can also be converted to NdF3 for further metal production. Further study will be undertaken in the future to find more energy-efficient and cost-effective method to convert the double sulfates to oxides and/or fluorides. Oxidation of the Fe in the upgraded ferrous WEEE is necessary to achieve a good leaching selectivity toward Nd. Nd can be successfully leached from the oxidized WEEE by supplying the minimal amount of H2SO4 that meets the stoichiometric requirements for dissolution of all nonferrous elements present in the upgraded ferrous WEEE. The temperature of the leaching process strongly affects the rates of the dissolution of both Fe and Nd. Increasing the temperature decreases the time required to reach stability (maximum recovery) from 37 min at room temperature to 6 min at 45 °C and to 2 min at 70 °C. Selectivity toward Nd can be increased by halting the reaction before the Fe reaction reaches stability; however, this becomes increasingly difficult as temperature increases. The influence temperature on the total metal extraction is less pronounced than its influence on reaction rate, but is still important. While 90% Nd extraction can be achieved at room temperature, the total Nd recovery can be increased to 99% at 70 °C. However, the total dissolution rate of Fe decreases from 21% at room temperature to 18.5% at 70 °C. A decrease in liquid/solid ratio (L/S) from 5 to 2 while maintaining the required acid volume only increases the rate of the reaction; it does not increase the final extraction level of Nd or Fe. A decrease in liquid/solid ratio (L/S) from 5 to 2 while maintaining the same acid concentration, thus leaching with an acid deficit, increases the selectivity of the leaching process toward Nd, by reducing the dissolved Fe from 21 to 9%. However, this is accompanied with a decrease of the Nd extraction to 72% compared to 90% achieved at L/S = 5. The supplied acid volume based on the stoichiometric requirement is the key factor that determines the Nd and Fe extractions, while temperature and acid concentration have only a minor influence. The Nd can be recovered from the leach liquor via the addition of Na2SO4. For optimal recovery and purity, the leach liquor must be re-acidified with H2SO4 to a pH of at least 0. This allows for the recovery of 92% of the Nd in the leach liquor as (Na, Nd)(SO4)2 with minimal impurities of Ca (8800 ppm) and Zn (2800 ppm). The obtained experimental results allow for the construction of a process flowsheet with a projected Nd recovery of over 90%. The authors are grateful to the EU project FP7 REEcover (Project ID: 603564) for providing the financial support, our project partners at INDUMETAl RECYCLING, Spain, for providing the ferrous WEEE input material and at Luleå University of technology for the physical upgrading of the material. For material analysis, we thank R. Hendrikx at the Department of Materials Science and Engineering of the Delft University of Technology for XRD, and M. van den Brink at the Department of Process & Energy of the Delft University of Technology for ICP-OES.